The use of the so called lower pitch 392 Hz, which we know, Johann Sebastian Bach used as well! 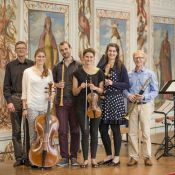 Premiere recordings of compositions by Tyrolean baroque composers. What are we going to record? Besides the Brandenburg No. 2, which we will record in its probably original setup as a quartet of soloists with only basso continuo accompaniment, we will also record a concerto by Georg Philipp Telemann for trumpet and 2 oboes TWV43:D7, as well as quartet TWV42:G6 for recorder, oboe, violin and harpsichord. With the use of the low pitch, both Telemann pieces and the Brandenburg Concerto will gain a well balanced ensemble sound. The CD will also include sonatas that have never been recorded before, music for recorder, oboe and trumpet by Gottfrey Finger (1660-1730) who was the concertmaster at Innsbruck Court at the time. It is very important to us to produce a well researched CD. Therefore we are lucky to have the music archive of the «Tiroler Landesmuseum» as cooperators. The development and creation of an informative CD booklet raises costs. The funded and self-raised budget of EUR 3’000 will go towards the final stages of the CD production. Therefore we depend on YOUR support towards financing the recording. As a thank you we have prepared lots of different treats. For sure there is something in there for everyone! Inform your friends and family via Facebook and share the link to our WeMakeIt presentation! Du kannst uns unter die Arme greifen, indem Du hilfst unser Projekt bekannt zu machen! Informiere Interessierte in Deinem Bekanntenkreis via Facebook und teile vor allem den Link zu unserer WeMakeIt Präsentation!